Darren Murray celebrates at Seaview as Portadown defeated Crusaders by 2-1. Pic by PressEye Ltd.
Darren Murray dominated the talking points as Portadown produced a superb performance to defeat defending champions Crusaders on the opening weekend of the Danske Bank Premiership. Murray was at the centre of the summer debate due to a transfer request turned down by the Ports. He claimed centre-stage at Seaview with two goals and a red card in Portadown’s 2-1 victory. Murray slotted home a penalty kick then displayed superb solo skill to put the away side into a 2-1 lead. However, his afternoon was cut short by a red card for a second bookable offence. His first yellow card appeared to arrive for time-wasting as Crusaders prepared to restart play. His second came late on when adjudged to have fouled Joshua Robinson as the Crusaders man attempted to shield the ball. 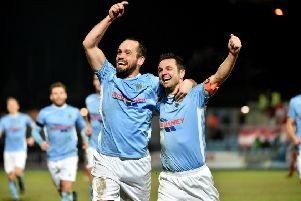 It seemed harsh but there is some speculation that the match officials may have spotted Murray kicking out at Robinson, although a sympathetic handshake by manager Ronnie McFall would suggest the Ports player’s innocence within the away camp. Gary Twigg proved sharp early on, with one lob at a stretch dropping wide then another shot saved by Sean O’Neill. Twigg was also alert on nine minutes to drive into the box and a foul by Robinson led to Murray grabbing Portadown’s first goal of the Danske Bank Premiership season with a confident penalty kick. The Crusaders response featured a period of pressure by the defending champions and Paul Heatley curled home from distance off the inside of David Miskelly’s right-hand post. Portadown hit back after the half-hour mark when Murray displayed superb control to dance past the Crusaders defence and smash home a shot off the underside of the crossbar from a tight angle. Miskelly raced out to block Heatley but the Ports continued a test the home side and a shot off teenager Jake Richardson was blocked by David Magowan. Sean Mackle forced O’Neill into a smart stop with a drive from distance as the Ports entered half-time in control. Early Crusaders pressure after the interval failed to break down determined Portadown. Heatley’s measured pass picked out Jordan Forsythe inside the area but Keith O’Hara was in place to clear the danger after a delicate lob over Miskelly. Forsythe then guided a shot towards the top corner but Miskelly pulled off a superb stop to claw the attempt out of the danger area. O’Neill’s reflex save prevented Portadown from extending the lead after Peter McMahon’s hooked shot off a Chris Casement throw-in. However, late drama featured with Murray’s red card on 83 minutes before a the final whistle confirmed a winning start to the season for Portadown. CRUSADERS: Sean O’Neill, Billy Joe Burns, David Magowan, Joshua Robinson, Craig McClean, Matthew Snoddy, Andy Mitchell, Jordan Forsythe, Jordan Owens, Gavin Whyte, Paul Heatley. Subs: Graham McKibbin, Cameron Stewart, Richard Clarke (on for Magowan, 46 mins), Diarmuid O’Carroll (on for Snoddy, 68 mins), Richard Vauls. PORTADOWN: David Miskelly, Chris Casement, Ross Redman, Keith O’Hara, Chris Ramsey, Sean Mackle, Darren Murray, Ken Oman, Gary Twigg, Robert Garrett, Jake Richardson. Subs: Billy Brennan, Peter McMahon (on for McMahon, 54 mins), Garry Breen (on for Oman, 65 mins), Marcio Soares, Christian Stewart (on for Twigg, 75 mins).